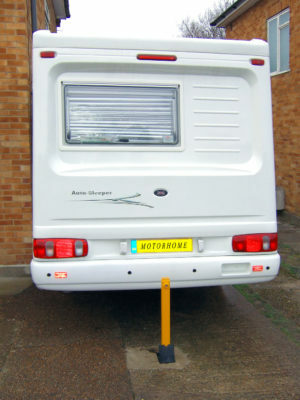 Having physical security devices on show in your is one sure way to prevent motorhome theft and deter thieves. It’s common sense really, the more secure your motorhome looks the more likely a thief is to walk on by. The industry has recently seen an increase in motorhome thefts in the UK and across Europe, according to vehicle security expert Tim Booth. We’ve also seen an increase in motorhome theft-related claims costs in the last 12 months. Tim says this rise is driven by, not only the demand for people to have leisure vehicles, but also the availability of parts to repair vehicles. So in addition to electronic security such as immobilisers, alarms and tracking devices it’s important to make your motorhome looks less desirable to a would-be offender by considering investing in physical security devices and making sure your storage location is ultra secure. Never leave valuables on display in your motorhome. Make sure you’re always in control of your motorhome keys – don’t make it easy for them to be stolen. Don’t give your keys to anyone other than your dealership or service centre. Property mark items with your postcode using a UV pen. You might consider putting your registration number on the roof of your motorhome. It’s helpful for Automatic Number Plate Recognition (ANPR) technology if stolen. But don’t do this if you have a personalised number plate as it will de-value your vehicle when you have to remove it. Look at security around access doors which lead to storage areas under the bed. A simple personal attack alarm is ideal for these spaces. Attach the cord to the inside of the door so when the door is opened it activates the alarm, creating lots of noise. Upgrade window and door locks but be careful that any adaptations to your motorhome don’t cause a lot of damage in the event of someone does try to break in. Make sure your storage site has good 24 hour security. 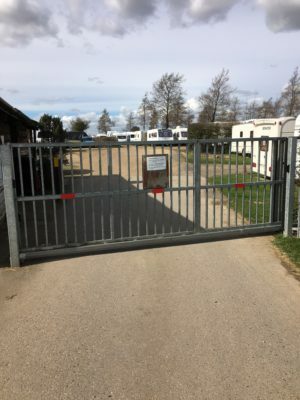 Or at home keep your motorhome behind lockable gates with a durable chain and padlock or fit a drive post. Caravan Guard customers who have good storage security can save money on their insurance premium. There are a number of devices on the market which can beef up your motorhome security but also act a visible deterrent to combat theft. Externally, wheel clamps are available for motorhomes. 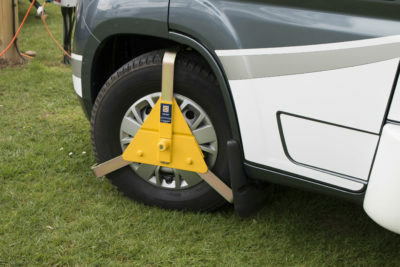 A wheel clamp can be quickly locked around your ‘van’s wheel in seconds and are often heavy duty and brightly colourred so they’re highly visible to deter thieves. 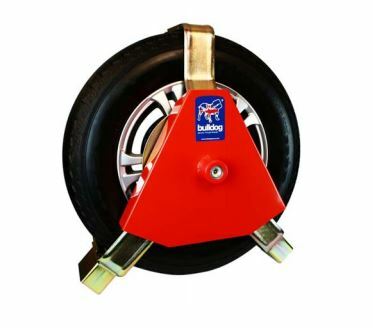 The Bulldog CA2000C Centaur Wheel Clamp is a heavy duty lock suitable for the protection of motorhomes. It uses a steel disc to protect wheel nuts whilst locked into position on the wheel. It also has Sold Secure Gold standard which means it has been attack tested using known theft techniques. Heavy duty, steering wheel locks such as the Disklok are a strong and effective way to protect your motorhome and suggests you are serious about the security of your vehicle. Not only has the Disklok been tried and tested against would-be car thieves and professional security testers it acts as a high visibility deterrent as it covers the steering wheel. It also claims to help prevent airbag theft and deter electronic theft. 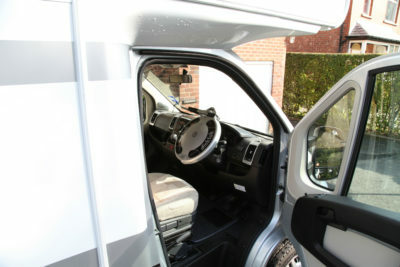 Their range of steering wheel locks cover a variety of steering wheel sizes. Clutch locks work by securing the clutch and brake pedals together and when you’re out and about they also promote that you’re a security conscious owner. The Centinel Clutch Claw has resisted tests using a professional car thief for more than 30 minutes and have versions available for VW Transporters and a range of base vehicles, including Fiat Ducato, Mercedes and Peugeot Boxer. 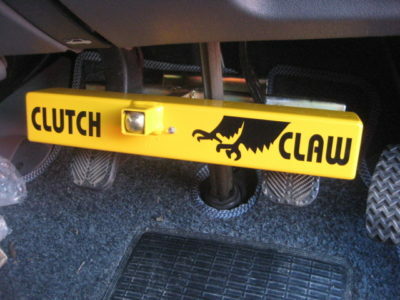 There’s also a new version of their clutch claw which will fit a VW Bay Window and Type 2 campervans. The claw also comes with flashing LED and window stickers to warn off thieves. The Safe T Pedal from Shire Fabrications is a mechanical anti-theft device to prevent access to the pedal area of your ‘van. It’s secured around the brake pedal, preventing access to any of the pedals and weighs between 3 and 6kg. The Safe T Pedal is available for the VW T4 and T5 as well as Ford Transit MK5 and MK6. A security post on your driveway is another great visible security measure which could make a thief think twice about trying to steal your motorhome. They’re relatively cheap to buy but you also need to factor in having them fitted into your driveway. There are a number of variations – telescopic, removable and fold down – which are locked into the ground to create a robust barrier to secure your vehicle behind. They’re also easily removed when you need to drive your motorhome away. Manufacturers of these posts include Bulldog, Sentinel and NKGroup. Expect to pay: From £65. Caravan Guard customers who fit a security post to their driveway can benefit from a discount on their insurance premium, but do need make sure that it’s locked and in place at all times when the motorhome is in storage on the driveway – not just overnight. Make your motorhome the one a thief is less likely to attack by installing an alarm and proactive tracking device as well as taking other security precautions. An approved tracking device will also be rewarded with a healthy 25 per cent motorhome insurance discount with Caravan Guard. See our motorhome tracker page for the types of devices you could fit. Do you have any motorhome security tips to share? Feel free to leave them in the comments box below. Insurance discounts are subject to terms, conditions and underwriting criteria. Minimum premiums apply. I have a folding handle helps with access to the van, but also locks across my hartel door handle so you have to remove it before you can even start to break in to the door. All doors & lockers and rear garage are wired in to the alarm system, I use a big chain & look on a steel farm type gate, and a steering wheel lock and I have a tracker, do you think I am over the top, I don’t. I have one of those big wheel locks in the garage I think I will fit that to the motor home tomorrow as well. and when I am away the large black dog looking out at you appears to put people off as well. great article and I like the idea of turning the seat we can all learn from each other. It doesn’t sound over the top Jim. Thanks for sharing. Have had a disklock since first Motorhome in 2004`. This, plus a pro-active tracker, gives me peace of mind and attracts a small insurance discount. Although I leave the blinds UP the cab side windows are left without internal covers so the would-be thieves SEE the deterrent. I am shocked to see an insurance company telling us to advertise our address when we are away, by means of showing our postcode to all and sundry on external items we use. Should we put the house number on to make it even easier for them! Thanks for pointing this out Robert. It’s a good point so we’ve amended to suggest property marking items with a UV pen. Our external locker enters the van under the double bed how can I better secure this locker as this will be the easiest entry for any thieves I believe? A simple personal attack alarm is ideal for these spaces. Attach the cord to the inside of the door so when the door is opened it activates the alarm, creating lots of noise. 2007 hymer with tracker and immobiliser and alarm still got towed away after breaking window smashing ignition and shorting out indicator to silence and short out thatcham alarm from 500 yards from house at midnight fortunately thieves unable to remove to breaking or shipping and police and tracker informed us although tracker rang mobile which was on ground floor whilst we where asleep on first floor now is only parked in secure lock up what ever time we return from where ever don,t suppose you will stop the determined. my motorhome has a removable steering wheel should keep them away. I have fitted dead locks on every door, internal on driver and passenger doors and external on main and garage doors. Also Oxford now do a cheap tracker device, that’s actually a Norwegian product called Dan Tracker. I have it tucked away at the back of a cupboard out of site and provides 24/7 interactive tracking via an app on your pc or phone. It will send an message to your phone if moved and gives live tracking location. Hi Rene, you could try Romahome and see if they have a specific wheel clamp. Alternatively, wheel clamps such as the Bulldog Centaur have adjustable arms to allow fitment to a variety of wheel sizes. Motorhome immobilisers are not perfect. They still get stolen! Don’t put all your eggs into one basket. Have a range of devices, one of which MUST be noisy! A cheap PIR alarm is noisy and a deterrent. Better still – two of them, one at each end. At £5 each on eBay you have nothing much to lose! Beef up door security too – especially the cab doors. The key-locking window sash lock/jammers are good. At about £5 each on eBay but you have to be prepared to drill into your door frames. A Milenco habitation door lock is about £60 for the type you can lock from both sides. Or ALL of the above! Ask yourself what your van’s worth. Thanks for your comment Lionel. It’s not absolutely necessary to follow all of the advice here and/or buy all of the equipment promoted here. The simple fact is that if you buy the fake tracker stickers then that will immediately deter the non professional thieves but will only slightly deter the professional thief. Similarly, a simple flashing red led or a simple sticker warning that your van is protected with an alarm will do exactly the same, meaning that it will deter everyone but the professional thief. But even the Police will tell you that if you are unlucky enough to be targeted by a professional thief (only a small minority of crimes are done by these types of thief) then they will find a way around almost any type of defence you can put on your van or even your home! The moral of my story is simple… The law of diminishing returns comes into play here as a few pounds spent on a few fake warning stickers and/or a few fake led flashing lights will probably reduce your chances of being a victim of crime by about 90%! The remaining 10% will be by the professional or desperate. Both of these types of criminal will see almost no barriers however much you spend, so spend smartly and cheaply. After that, then if you become a very small minority victim… Well, isn’t that what you pay your insurance premiums for? I’ve installed a very simple solution that would make the vehicle very difficult to drive. Turn the drivers seat around so it’s facing as far in the reverse direction as possible, then drill a hole through the rotating part of the seat and the static part of the base. Buy a big heavy weight padlock and lock the two together. Anyone who can drive the vehicle with the seat facing in the wrong direction must be Houdini. Cost, about 10 minutes to drill a hole and a padlock about £35. All these security devices are useless if the thieves can get hold of the keys. Do NOT leave keys accessible inside your home. ‘Electronic Tracker Fitted’ sticker. Some say that a major security feature of having a tracker is that its presence is not disclosed to the thief. In fact, it can be argued that identification stickers are an encouragement to thieves to damage the vehicle in an attempt to locate the unit. ANPR cameras read front/rear plates only, they CANNOT read a registration mark on a vehicles roof! As an aside when you see vehicles on transporters there is a length of gaffer type tape across the reg plate. It’s to stop ANPR cameras “reading” the plate and trying to say the vehicle has driven through a toll/congestion zone etc without paying!! Get your friendly mechanic to show you what fuse to pull to render your motorhome unable to start it costs nothing and even if the toe rags get your keys their not going to get it started ! If you put stickers on saying that you have a tracking device fitted they’re likely to rip your motorhome apart trying to find it.If they don’t know it’s got one you have got a good chance of finding your pride and joy. Rubber snakes attached with fishing line. To doors, windows, overhead lockers, inside your fridge, under your bog seat. Baddies will perhaps run for the hills. Thanks for commenting. We appreciate that many vehicles do have immobilisers but wanted to highlight that having a visible device could act as a further deterrent and show that you’re serious about security. Good ideas covering most areas. We do mention tracking devices near the end of the article John and how secure storage is one of the crime prevention tips, as well as highlighting how it can save money on your insurance premium. You can also buy fake ‘electronic tracker fitted’ stickers to put in your windows. You can have the registration number printed on these for added authenticity. Available from a leading Internet auction site! Currently, there does seem to be an alarming increase in this type of “easy” theft, perhaps of a second, or leisure vehicle, so anything that you can do that is easily visible and a deterrent, will be advantageous in protecting your valuable asset and future enjoyment. Plus, if and when you get it back, there is no guarantee what condition it will be in and what personal processions will be lost forever! A few seconds in preparation can save a lot of heartache further down the line. I also find that a cheap red flashing fake alarm light, working in tandem with the original manufacturers alarm is another visible deterrent. Happy camping.